In Discourse Grammar of the Greek New Testament, Steve Runge, scholar in residence at Logos-Bible-Software, explores New Testament Greek grammatical conventions by focusing on the communication tasks they accomplish through discourse analysis. His focus on discourse analysis emphasizes the ways in which words are used in texts and contexts, and has less to do with the elements of speech and focuses, instead, on how humans cognitively process language. In doing so, Runge is consciously building on the ground breaking work of James Barr entitled Semantics of Biblical Language which focused on lexical linguistics (an element of speech) rather than grammatical linguistics. Runge, in effect, picks up from where Barr left off and attempts to show the exegetical significance of discourse grammar for students of the New Testament. Runge's project is dynamic and multi-layered. One might even call it a "cross-linguistic" and "function-based" approach to discourse analysis that treat aspects of the language often examined in isolation, or only with lip-service. The result, according to Daniel Wallace, is that Runge "has made discourse analysis accessible, systematic, comprehensive, and meaningful to students of the New Testament". As such, Runge's Discourse Grammar of the Greek New Testament offers direct treatment of linguistic phenomena often truncated or all together mishandled by traditional grammars. 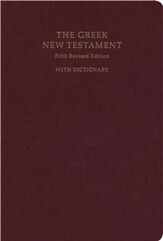 Runge provides ample examples from the New Testament to illustrate his points, and does so with accompanying commentary. Everywhere he demonstrates that "if there is more than one way of accomplishing a discourse task, there is likely a meaning associated with each choice" (148). In some ways Runge's book seems like it may be a substitute for traditional grammars. It is not. It is, rather, a grammar that augments specific aspects of the language that traditional grammars often do not have, or choose not to have, room to highlight the importance of discourse analysis for sound exegesis. In Discourse Grammar of the Greek New Testament, Steve Runge introduces a function-based approach to language, exploring New Testament Greek grammatical conventions based upon the discourse functions they accomplish. Runge's approach has less to do with the specifics of language and more to do with how humans are wired to process it. The approach is cross-linguistic. Runge looks at how all languages operate before he focuses on Greek. 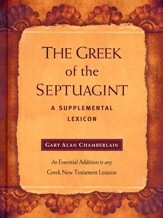 He examines linguistics in general to simplify the analytical process and explain how and why we communicate as we do, leading to a more accurate description of the Greek text. The approach is also function-based--meaning that Runge gives primary attention to describing the tasks accomplished by each discourse feature. This volume does not reinvent previous grammars or supplant previous work on the New Testament. Instead, Runge reviews, clarifies, and provides a unified description of each of the discourse features. That makes it useful for beginning Greek students, pastors, and teachers, as well as for advanced New Testament scholars looking for a volume which synthesizes the varied sub-disciplines of New Testament discourse analysis. With examples taken straight from the Lexham Discourse Greek New Testament, this volume helps readers discover a great deal about what the text of the New Testament communicates, filling a large gap in New Testament scholarship. Steven E. Runge (DLitt) serves as Scholar-in-Residence for Logos Bible Software, and as a Research Associate for the Department of Ancient Studies, University of Stellenbosch. 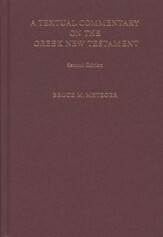 He is the General Editor of the Lexham Discourse Greek New Testament. 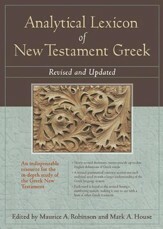 "Steven Runge, scholar in residence at Logos Bible Software, has produced a book of great value for those who desire a clear yet well-grounded introduction to discourse analysis of NT Greek. Discourse features of a language are those that operate above the word- or sentence-level, an area of analysis neglected by traditional studies of NT Greek. Unfortunately much of the growing body of literature in this area is narrow, technical, jargon-tilled, and essentially impenetrable for the non-specialist. The strength of this book is that it covers a wide range of such features with technical competence but in a way that clearly explains the features, illustrates them with multiple examples from the NT, and enables the reader to use the information in his or her own study of the text. "In his work Runge draws upon formal study and informal interaction with linguists such as Stephen H. Levinsohn, Christo Van der Merwe, Stanley Porter, and Randall Buth. He incorporates principles from works on information structure and functional grammar by Knud Lambrecht, Simon Dik, and Talmy Givon. This approach to discourse analysis focuses on how languages structure information flow across larger units, adding new elements to what is already given, maintaining coherence and continuity across the discontinuities that come, and giving greater prominence to some information along the way. "One of the helpful features of Runge's approach is his attempt where possible to engage with traditional works on NT Greek (e.g., Blass-Debrunner-Funk, Bauer-Arndt-Gingrich-Danker, Moule, Moulton-Turner, Robertson, Wallace) to build on areas of agreement and to amend or augment their treatments where they miss the mark. This makes the book more user-friendly for those more familiar with such approaches. "Among the chapters of particular value for NT interpreters are several that provide marked improvements on traditional understandings: those on Greek conjunctions, the historical present, and the near/far distinction (demonstratives). Also very significant is the whole section on ''Information Structuring Devices" (part 3 of the book). Here Runge sorts out two different functions, often related to word order, that are usually called "emphasis" in NT grammars (e.g., BDF §§ 472-473 ). These are (1) topical framing devices that give a grounding point for what is about to be said and also connect it to what has already been introduced: and (2) newly asserted or focal information that has been placed in marked position. Two other useful topics that receive scant treatment in traditional grammars are (1) point/counterpoint sets and (2) over-specification and right-dislocation (thematically important ways of referring to participants). "The second printing of the book is well served by extensive indexes (authors, subjects, ancient sources) that are omitted from the first printing but are available for download at ntdiscourse.org." "This book aims to introduce readers of the Greek NT to discourse analysis (also known as text linguistics) and the insights that such an approach can bring to the study of this text. While traditional grammar has tended to focus on language at the level of the sentence and below, discourse analysis looks beyond the sentence to the wider context of an utterance--the extra-sentential level--and its function. The book is divided into four parts: Part 1 (Foundations) introduces discourse analysis and surveys connecting prepositions; Part 2 (Forward-Pointing Devices) surveys prominence-marking strategies; Part 3 (Information Structuring Devices) focuses on word order; and Part 4 (Thematic Highlighting Devices) examines ways in which the use of language influences readers' mental representations of discourse. A short summary at the end of the book provides a tabulation of some 14 distinct discourse devices. "Discourse analysis is an undeniably complex field. However, Runge has produced an extremely lucid and useful introduction. The book does not seek to dispense with earlier or alternative approaches: as Daniel B. Wallace states in his forward, the present volume 'is a complement to traditional grammars, rather than in competition with them ' (p. xvi). Indeed, Runge begins most chapters by reviewing the 'conventional' explanations of a linguistic phenomenon before presenting the 'discourse' ones. 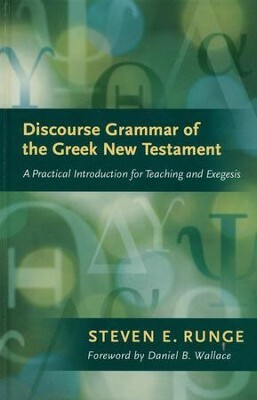 Runge makes extensive and helpful use of comparison with English discourse devices and offers ample illustrations from the NT (given in both Greek and English). This book is an intelligent guide to a difficult but vitally important approach to our understanding of texts." "The purpose of this book is to introduce a function-based approach to language using discourse grammar. It presupposes three core principles: Choice implies meaning; semantic or inherent meaning should be differentiated from pragmatic effect; and default patterns of usage should be distinguished from marked ones. After treating foundations and connecting propositions, it discusses forward-pointing devices: forward-pointing reference and target, point/counterpoint sets, metacomments, historical present, redundant quotative frames, and tailhead linkage. Next it considers information structuring devices: information structure, framing devices (two chapters), circumstantial frames, emphasis, and left-dislocations. Then it deals with thematic high lighting devices: overspecification and right-dislocation, thematic addition, changed reference and thematic address, and near/far distinction. Runge is scholar-in-residence for Logos Bible Software and research associate for the department of ancient studies at the University of Stellenbosch." I'm the author/artist and I want to review Discourse Grammar of the Greek New Testament: A Practical Introduction for Teaching and Exegesis.